Sometimes the works were refered to as the Baltimore Works and sometimes as the Albion Works. The two works were likely one and the same, or at least occupied the same site. 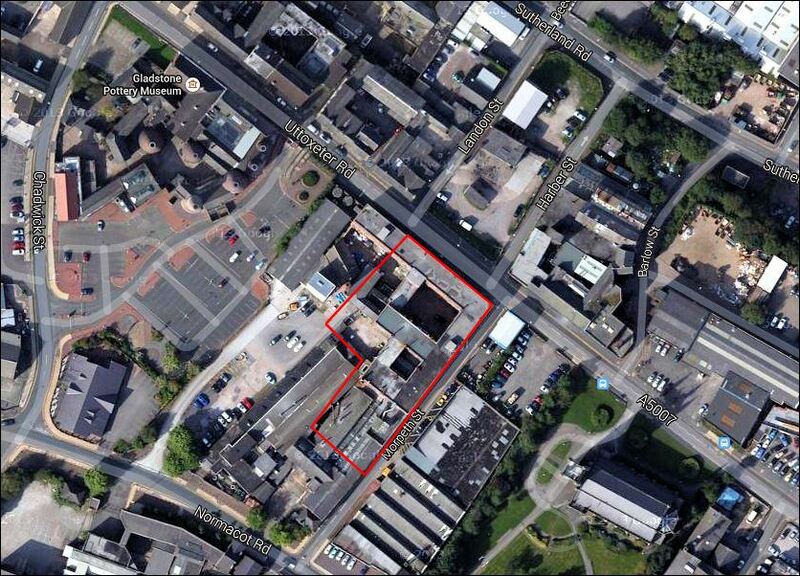 The works were located on the junction of the High Street and Albion Street, Longton, Stoke-on-Trent. Sometimes more than one company shared the works at the same time. 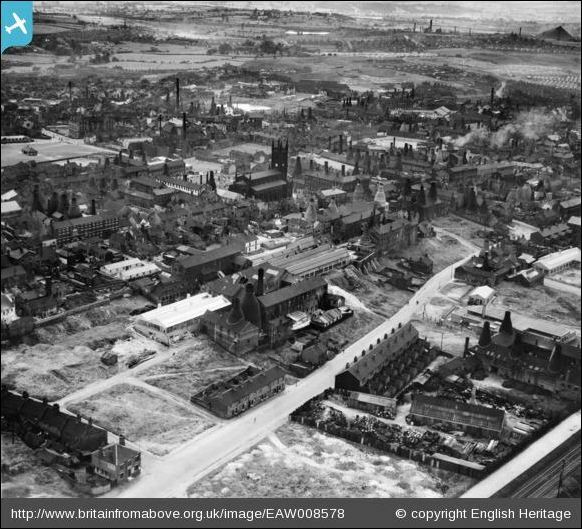 A fire was reported at the 'Baltimore Pottery Works, Albion Street, Longton' in 1891. 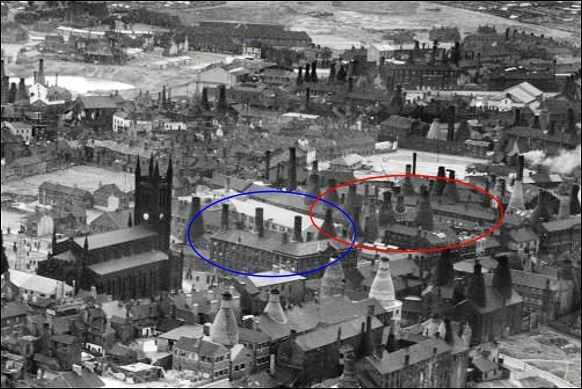 By 1950 the OS map shows that the factory had been rebuilt as 'Albion Works (electrical porcelain)' with previous lay-out still extant. In the mid 1950's Albion Street was renamed to Morpheth Street. 1796 1829 Weston and Partners Works of George Weston (and partners) probably located on this site from at least c.1799-1829. James Hull left a partnership with George, William and John Weston in 1796,which was probably operating from the same site. A Thomas Harley was also involved in the partnership but left in 1801; John Weston left in 1804. 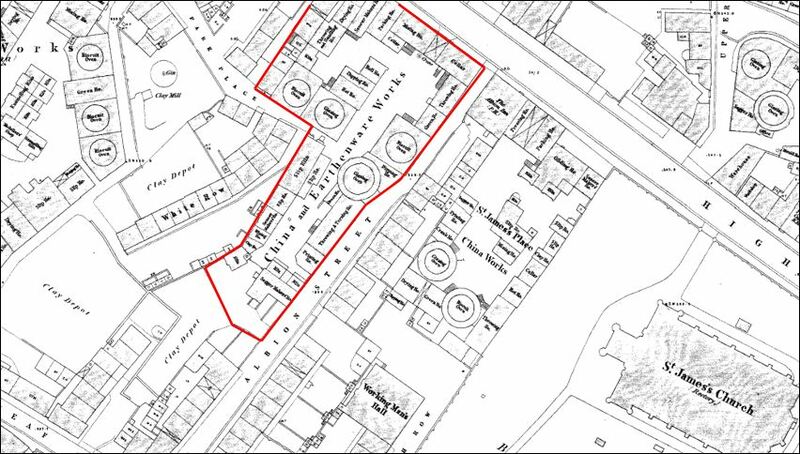 George and William Weston dissolved the partnership in 1815, leaving George Weston to continue the business, possibly with his son, until his bankruptcy in 1829.
c. 1831 1858 Allerton, Brough & Green Probable that by the 1830's the works was owned by Allerton, Brough& Green (and successive partnerships) of the adjacent Park Works (and other manufactories). 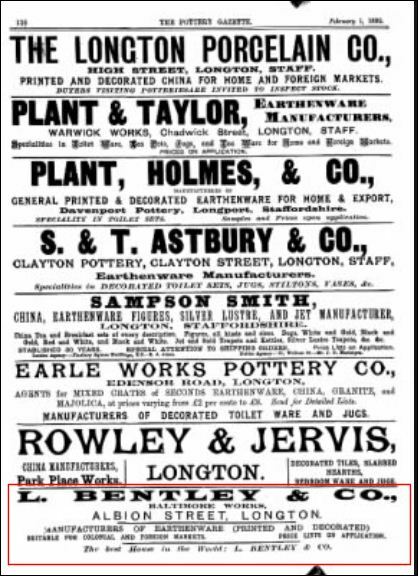 1880 Morley & Co. Partnership between William Morley and Alfred Wright Steels as earthenware manufacturers - which was dissolved in August 1880. William Morley continued the business. The partnership was dissolved in May 1882. 1880 1882 W Morley The business was continued by William Morley in connection with his business as earthenware manufacturer at the Baltimore Works. 1880 1889 George & Thomas Day Originally in partnership with John Aidney as Aidney & Co. - this partnership was dissollved in 1879. George & Thomas Day were recorded at the Albion works in 1880; from c.1882-1889 George Day was in sole charge of the business. They were operating concurrently with other manufacturers at the works. 1882 1913? 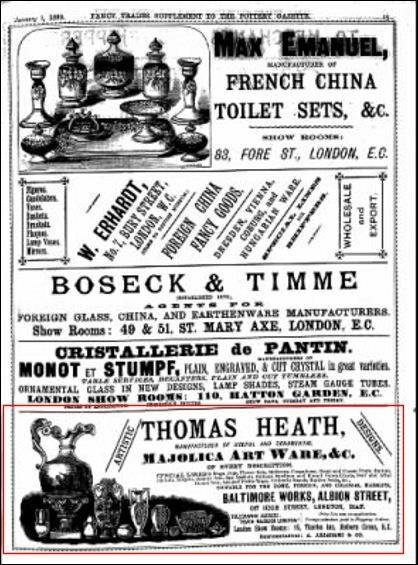 Thomas Heath Thomas Heath manufacturing earthenware and majolica. Evidently shared the works with other manufacturers. 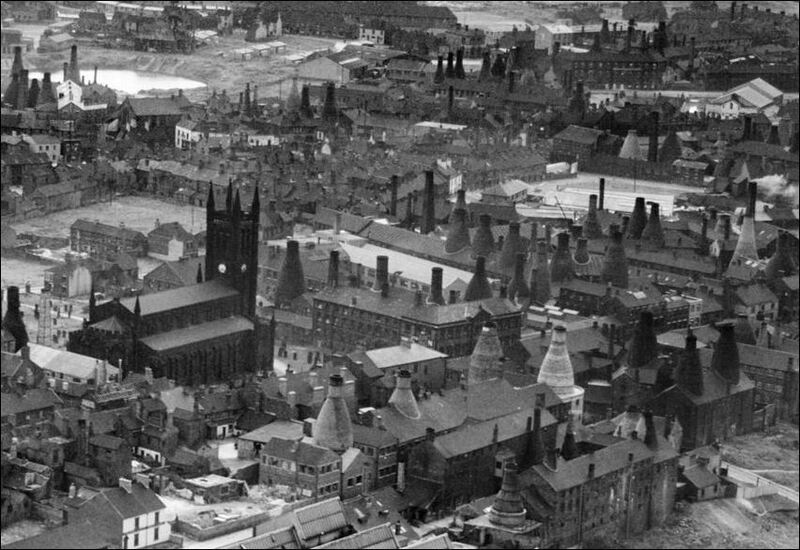 at the Baltimore Works J. W. Beswick James Wright Beswick began earthenware manufacture in 1894 at the Baltimore Works, Longton. 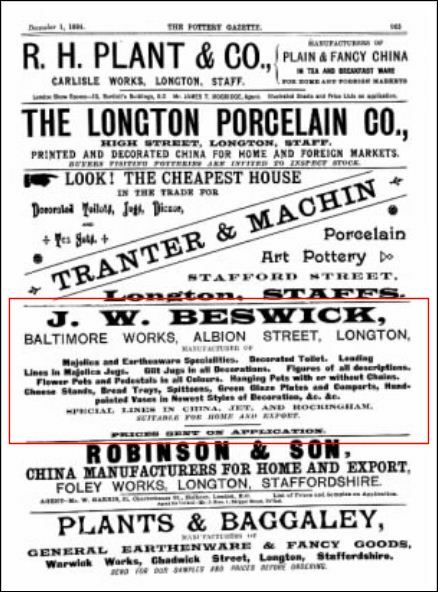 The business expanded rapidly and in 1898 took over the Gold Street Works (where they continued until 1969) which became firmly associated with the Beswick name producing the famous Beswick animals. 1898 1901 Robinson & Jones William Henry Robinson was in partnership with Frederick William Jones. 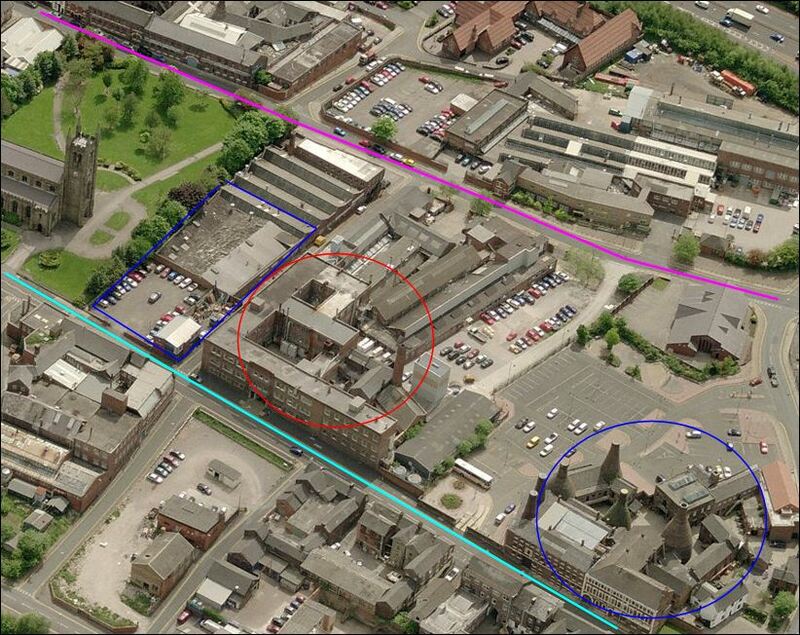 The Albion works are still (in 2014) in existence and three business's are in operation at the works: Royal Winton Pottery, Ceramic Gas Products Ltd and Taylor Tunnicliff Ltd.
Majolica and Earthenware Specialities. Leading Lines in Majolica Jugs. Gilt Jugs in all Decorations. Figures of all descriptions. Flower Pots and Pedestals in all Colours. Hanging Pots with or without Chains. Cheese Stands, Bread Trays, Spittoons, Green Glaze Plates and Comports, Hand-painted Vases in Newest Styles of Decoration, &c. &c.